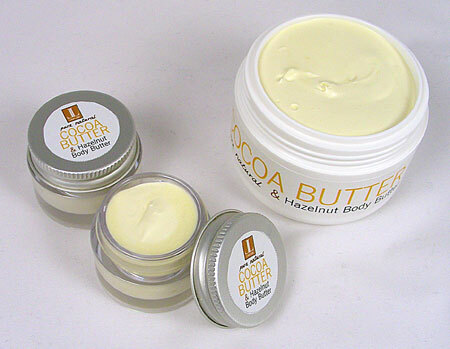 Thanks to the lovely ladies who posted a comment to test this body butter. To have some kind of continuity in the feedback on this product, the 2 winners of this draw will both be automatically included as testers for the next batch as well – so it's a double win! The last time I did a giveaway, the names were literally drawn from a hat. This time, a basket was the chosen receptacle. 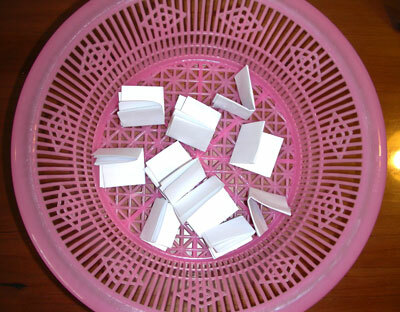 All comments were printed out and put into this pink plastic basket that I normally use for... uhm.. nothing. (it was in the back of a cupboard). My utterly unbiased and neutral husband was once again asked to draw 2 names. (He didn't want to be photographed this time, so you're going to have to trust me that he looked the other way while doing it). Congratulations to Lene and Lana! Yay! Please email me your address and your test sample of body butter batch 2 will be in the mail as fast as I can package it. Meantime, work continues on this product, and, as I promised Anette at BeautySpace, there will be a total of 10 testers next time. Den blanding kan anbefales. Jeg har selv en ingefærolie. Den stinker!! Så det undrer mig egentlig. ja, man finder ofte at en æterisk olie der har en tung lugt gør sig rigtig godt i selskab med olier med modsatte karakteristika. Jeg vil dog gætte på at de har flere olier i deres blanding end kun de 3 nævnte. Nu er jeg selvfølgelig så nysgerrig efter at dufte den at jeg straks springer ud og finder en jeg kan snuse til! :) Tak for dit inspirerende input!